This winter is expected to bring some harsh weather conditions in Ontario, which will, unfortunately, leave a lot of people feeling helpless as they attempt to trudge their way through the heavy snowfalls. Those who are ill-equipped to handle these weather conditions and effectively remove snow from their properties could find themselves stuck at home for a good portion of the winter. Even though some municipalities offer snow removal and ice removal services on the street, your private or commercial property is a different story altogether. 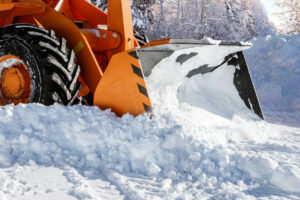 Certain snow removal mistakes could actually add on to your work and end up costing you a lot more money in the long run, so it’s important to learn what they are and how to avoid them. Anyone who was born and raised in Canada or has been living here for a number of years should be fairly familiar and comfortable with using a shovel. At one point or another, we’ve all had to shovel snow and lay down some de-icing agent or salt to prevent the snow from sticking to the ground. Regardless of your level of experience with handling the white stuff, though, there are certain things you should definitely be wary of to ensure that you’re removing as much of it from your property as possible. To maximize the effectiveness of your snow and ice removal method and minimize the amount of physically-intensive shovelling involved, you should always have a concrete plan of action. Start at one end of your property and work your way to the other side. Don’t rush the process as this can increase the risk of injury and always lift the shovelfuls of snow with your knees to alleviate the pressure from your back and joints. Take breaks as often as you need to and make sure to drink lots of water. If you’re unable to shovel the snow yourself, then don’t be afraid to ask for help. Far too often, people tend to underestimate how labourious shovelling snow can be and are too proud to ask someone to help them. Don’t be that person. Know your limits because it’s not worth risking your health. Depending on the size of your property and the amount of snow and ice that need to be removed, you may not have the right kind of equipment required to get the job done. Remember that snow and ice could pose serious liability issues if someone endures a slip-and-fall accident on your property, so this is not something you want to ignore. Sometimes a simple shovel isn’t enough to get the job done and you might have to call in the big guns. That’s where a professional snow removal company with high-end plows can help. They’ll examine your property, assess the amount of work that needs to be done, and then determine the right type of equipment to use for the job. Since Canadian winters are vastly unpredictable, it’s important to always stay on top of the weather forecast so you know exactly what to expect and keep your snow and ice removal equipment on standby. Failing to do so could result in more costly work for you in the future. FOREVER GREEN LAWN & LANDSCAPE INC. is your go-to expert snow and ice removal company this winter. We’ve been in business for over 20 years and all each and every single one of our crew members is specially trained in expertly removing snow and ice from your property. Contact us today to get a free quote for your property.